This week Scole travelled to face County Cup semi finalists Mattishall. A side that were in good form losing just once in the last 8 games. Squad news: due to unavailability of strikers Kieran Manning & Tom Dade, Scole legend Will Goulding made his long awaited return from Diss Town & UEA student Ivan Otono came into the squad. Kev Riches had work commitments which meant he played for the Ressies but Joe Hooton returned after being away. Following a poignant tribute before kick off to local youngster Denver Clinton where both sides gave a minutes applause as Denver's mother placed a wreath on the centre spot. Both sides started in a positive fashion. Mattishall showed that their disciplinary reputation had legs with some hefty challenges and rather vociferous altercations with the officials! However it was Scole who drew first blood with a great breakaway goal after skipper Lee Tricker cleared to Will Goulding who sent a cornfield ball over to Joe Hooton who then took the defence on and delivered a deep cross which Ben Norton-Hugman finished at the far post. Scole got a second when they defended a Mattishall corner and speedsters Callum Bray & Joe Hooton combined,this time Hooton went through on goal to score. Scole were looking good now and seemed to be in control when just before half-time there was a disturbance between the 2 benches which resulted in a Mattishall coach being red carded and ordered away from the pitch following some unsavoury behaviour and language. Whether this unsettled the Scole side is questionable but it certainly fired up the home side and amid the hostile atmosphere they pulled a goal back very early in the second half after Scole failed to clear their lines. However 3 minutes later the Hooton /Bray combination came to town again when Hooton attacked from the left and cut inside until he was inevitably brought down. 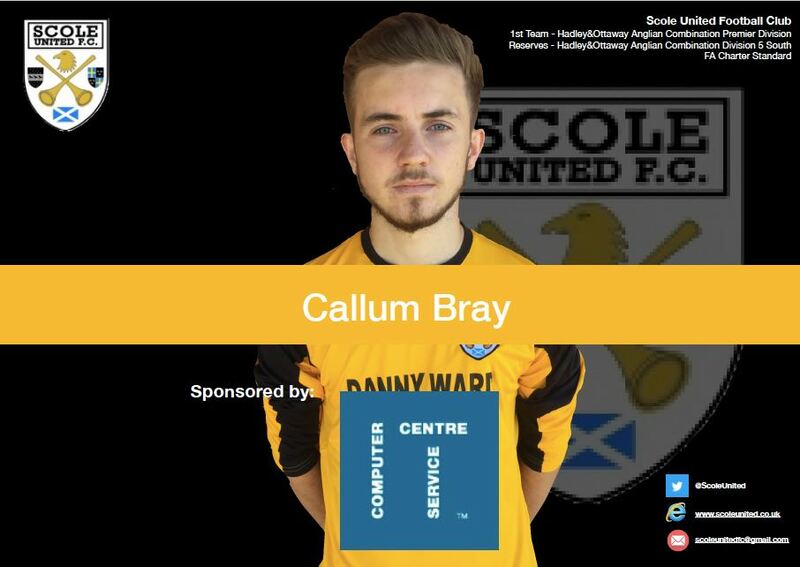 What followed was a goal of the highest quality from Callum Bray who curled the free kick into the corner of the net around the wall. Goulding tired after a massive shift upfront on his own was replaced by debutant Otono and Dan Betts took a knock to be replaced by Jimmy Dunkinson. Mattishall surged forward looking to get back into the game and were rewarded when their dangerous skipper scored with a header from a corner. Hooton had to come off for Cal Boulter as Mattishall pushed for the equaliser and Scole were defending for their lives. 6 minutes from time and Mattishall got a hotly disputed goal when left back Lawrence Brown was clipped from behind but the referee waved play on and the forward went on to score much to the delight of the home support. Scole held on for the point which was harsh considering for the vast majority of the match they were by far the better side. However another good performance and point away from home bodes well. Player of the match: For a tremendous goal and all round good play Callum Bray. Next week's game is away against St Andrews.